The inspiration behind this stunning polish is this amazing fire opal. All the makes this month did justice to their inspiration, but Rachel REALLY nailed the inspiration with her polish! Maker description: Black jelly packed with a variety of fiery, shifting flakies as well as green tiny holo and blue holo glitters. Formula: I was pleasantly surprised by this formula, considering just how many pretty things are packed into it. It's on the thick side, but easily workable. At first I thought it might dry down textured, but one generous coat of topcoat was enough to easily smooth it all out. My thoughts: Once again, I'm in love. 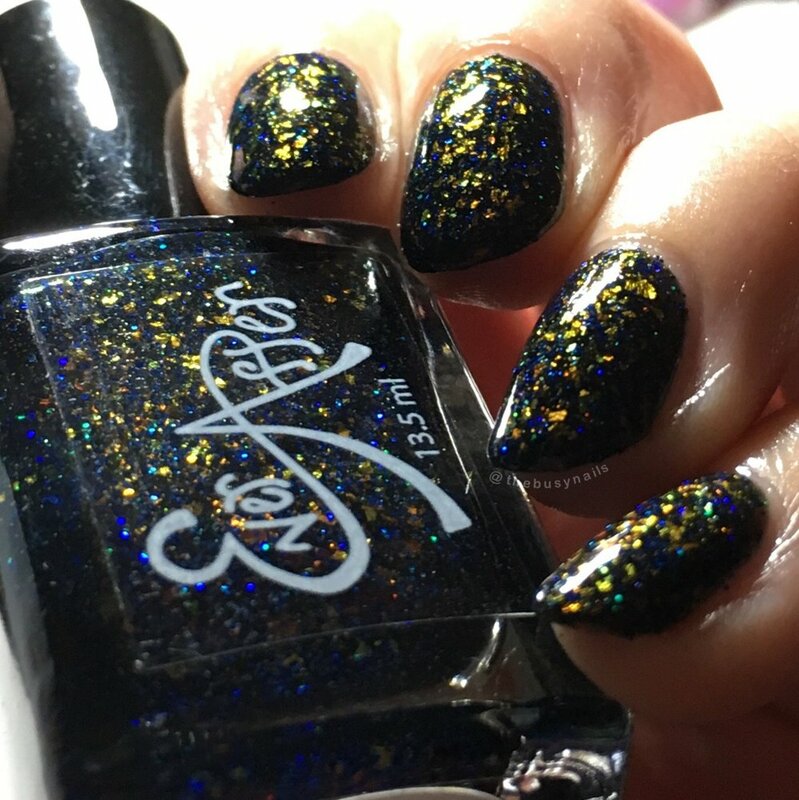 This polish is SO sparkly, but in a really dark, unique way, rather than a typical glitter. It really looks lit from within on the nail, and the little blue glitters are my favorite part - they give it this amazing spark! As I've mentioned before, I LOVE opals, so I was really excited to see so many makers choosing them as inspiration this month. I have to say that I think Rachel mimicked her inspiration photo most closely, which is so impressive considering how complex opals can be. See what I mean about nailing the inspiration?! Stone on the left, polish on the right. So impressive! You can purchase Ever After "Playing with Fire" on the Polish Pickup website Jan. 5th at 11 AM EST thru Jan. 8th at midnight EST for $11. There is no cap.